Madhya Pradesh MPBSE Diploma in Elementary Education (D.El.Ed.) I year, II year June 2019 Examination Time Table Download from mpbse.nic.in website. Note: Given below is the last year time table, we will update this year time table after released from the board. Madhya Pradesh Board of Secondary Education, MPBSE, Bhopal, conducting Diploma in Elementary Education (D.El.Ed.) 1st year examinations from 19th June 2018 to 26th June 2018 and 2nd year Examinations from 19th June 2018 to 29th June 2018. Examinations conducting in two sessions first session from 9.00 AM to 12.00 Noon and second session from 2.00 PM to 5.00 PM. 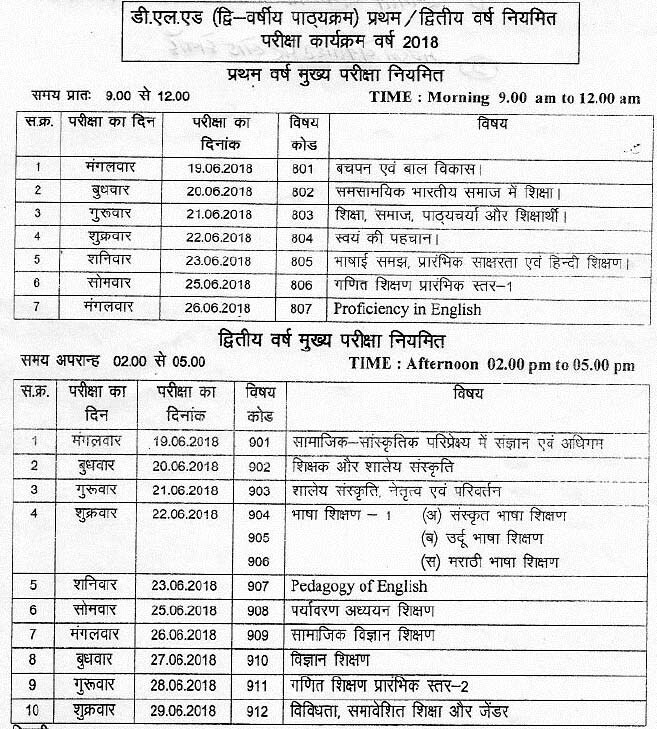 First year Examinations conducting in First session 9.00 AM to 12.00 Noon and Second year examinations conducting in second session from 2.00 PM to 5.00 PM.